CNNThe package and bomb sent to John Brennan at CNN’s New York newsroom on Wednesday. 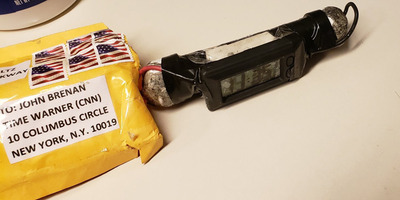 Packages with bombs sent by mail this week to prominent political figures and critics of President Donald Trump appear to have been littered with spelling mistakes. The package addressed to former CIA Director John Brennan – which Business Insider has seen pictures of – misspelled his name as “Brenan” and misidentified the TV network he contributes to. Authorities are investigating instances of packages with bombs addressed to Hillary Clinton, Barack Obama, George Soros, John Brennan, and Eric Holder. Schultz, the former chair of the Democratic National Committee, reportedly received the package addressed to Holder after it failed to deliver to him. Envelopes containing pipe bombs that were sent this week to several prominent political figures and critics of President Donald Trump were littered with spelling errors, according to reports and photos of the packages. Rep. Debbie Wasserman Schultz, the former chair of the Democratic National Committee, was listed as the sender on all the packages,NBC News and the Miami Herald reported. A parcel containing a pipe bomb and an envelope of white powder sent to former CIA Director John Brennan was addressed to “John Brenan” and sent to the wrong network, images seen by Business Insider show. Here’s a photo of it shared by J.J. MacNab, a fellow at George Washington University’s Program on Extremism. As well as spelling his surname wrong, the package to Brennan was addressed to CNN’s office in the Time Warner Center in New York. Brennan is a contributor for NBC and MSNBC, which are based in Rockefeller Center. The one addressed to Holder was sent to Schultz’s office after it could not be delivered to him, NBC News and the Herald reported. Authorities are investigating instances of packages with bombs addressed to Brennan, Holder, Obama, former Secretary of State Hillary Clinton, and the billionaire Democratic donor George Soros, Business Insider reported on Wednesday.